Lately I’ve been thinking about testing out the various financial software available. It seems like there’s some really good tools out there to help with budgeting and making better financial decisions. 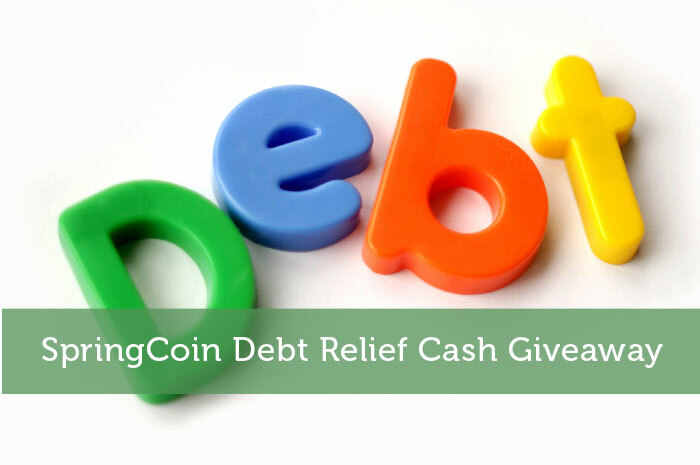 One of the tools I was looking into recently is SpringCoin which is basically an online debt relief coach. Since I have some debt that I’ve been putting off paying, I figured this might be a good option for me. Unfortunately you need to be a US citizen to use this software since it asks for the last 4 digits of your social security number to pull up your credit report. So it’s not something I’m going to be able to use myself. They do have a special promotion running where they are giving away free lifetime accounts until the end of this month. So if you’re an American and looking for help paying off debt quickly, now would be a good time to check out SpringCoin. The folks at SpringCoin were also kind enough to help out with an exclusive giveaway here at Modest Money. No they did not pay me anything directly for this post and I am not getting any kind of referral commission either. The signup process is quick and painless. Next, connect your primary checking account (similar to Mint.com) and SpringCoin will come up with a recommended monthly payment for you based on your spending. You have the flexibility to change the monthly payment per your request. And finally, complete your registration by confirming your payment amount. As I mentioned, this is a free lifetime accounts. They will NOT ask you for any payment information. After you complete your registration, SpringCoin will develop a personalized “debt free roadmap” and tell you who to pay, how much to pay, and when to pay. They follow the popular debt snowball approach to paying off your debts, but sometimes they will recommend paying off the highest interest rate first depending on your situation. Weekly Goals – SpringCoin provides (3) weekly goals for you designed to help you pay off your debts even faster. By completing each task, you can earn reward points that you can enter into raffles for prizes or cash! Bird’s Eye View of Account Balances – If you’ve used Mint before, it’s great to see an overview of all your account balances without logging into each account. You can connect your credit cards with SpringCoin to get an up to date balance for each credit card. Budgeting Tool – SpringCoin will generate a recommended monthly budget for you. Of course you can change your budget if you wanted to, but they’ll keep track of your spending for you. Bill Reminder – Not only can you connect your credit cards, but you can also connect your utility, phone/cable, or student loan bills. They’ll send you upcoming reminders of any bills that are due so you don’t incur any late fees. Personalized Roadmap – Lastly and certainly not least, SpringCoin gives you a debt free roadmap to help you pay down your debts as fast as possible. You can track your progress and change your monthly payment amount as well. So I invite you to enter the giveaway via the RaffleCopter script above. Also be sure to sign up for a free SpringCoin account. Both the giveaway and the free account promotion will close at the end of May. Good luck! Has anyone had experience with SpringCoin or other financial software? What were your experiences? Contest Update: Thank you to everyone who entered. The winners have been selected and e-mailed to arrange payment. Also, thank you to SpringCoin for helping out with this contest. Yeah it sounds like Mint is a popular option. I’m going to have to look into that one next. I am starting to dislike Mint (too many US offers) and this looks promising. I guess you missed my note about this only being available for Americans. It’s not surprising that Mint is full of US offers. Their market is far bigger than the Canadian market. Looks interesting. We use Quicken and like it a lot. There is even an iphone app for it now. I always thought Quicken was just for taxes, but I guess I’ll have to look into their other software too. Interesting. I am a US citizen, but does it actually pull your credit? I use Mint right now and it serves its purposes for the time being, but I think later on in the future when I have way more debt and expenses I’ll be needing a sophisticated software. From the sounds of it, it does pull your credit, but in such a way that it doesn’t affect your credit score. I know it’s not good to have your credit history pulled too often. Yes it does pull your credit report. It won’t show up as an inquiry though. You can manually enter your debts too if you wish to do so. hmm interesting, I think the best way is to manage it yourself, It’s just another way to get your information. Some people are able to manage it quite well themselves, but others need this kind of assistance. It sounds like it guides them on how to best approach paying off their debt and helps visualize things to increase motivation. Yet another software offer for only Americans. I understand the logic but it’s still annoying to see options that exclude us Canadians. I was bummed at first too, but considering it pulls credit history it’s understandable. It would be a lot of extra work to make it all work for Canadians too. Maybe there are some kind of technical obstacles in place that we don’t know about too. I signed up for SpringCoin before but was disappointed because it seemed to be focusing more on credit card debt then anything else – and I wanted to use it just for student loans. Also, they seemed to have a minimum monthly payment that was higher than the actual minimum (they set it at $600 and the actual minimum I’m paying is around $400). I really wanted to see how my debt life would change if I paid the minimum vs paying more but I couldn’t find how to do that so I lost interest. That’s too bad there are those kinds of limitations. I suspect SpringCoin will be keeping an eye on comments on posts such as this. They did tell me that they are working on new features that will be released in the coming month. So hopefully that is addressed. I will pass this note on to my contact though. Thanks for stopping by to provide some feedback Kevin. Also, thanks for your help with this giveaway. I love that they hooked you up with a free giveaway – that is freaking awesome! Well I admit they got a pretty good deal out of it. The prize totals is less than I would’ve accepted as a sponsored post. Luckily for them I was wanting to host another giveaway. So the timing worked out well. I am a huge fan of these guys. Nice review too! I’ve been following them for months and even got to give them some feedback along the way as they were developing. I think that they have a ton to offer and should be a serious contender soon. Thanks Nunzio! We definitely appreciate your feedback in our early stages. We’re still adding more features along the way as we’re collecting more feedback from people on this thread and from our customers. This is awesome! I did all of the above (I love cash giveaways!) I think it is awesome that you are offering something like this with only the benefit of your readers in mind. It is very clear that you are only doing this to help your readers out, and offering a service like this to help people get out of debt can really hit home! Thanks for the post and the opportunity to compete in the giveaway! Good luck Jeremiah. In hindsight, maybe I should’ve asked for some cash for myself too 🙂 I’m happy to help out my readers though. At this point, growth of my blog is more important than a quick buck. Interesting giveaway. I’m not sure about springcoin so I did not, but I did follow you on twitter and subscribe to RSS. Thanks for following even though you were not too interested in the giveaway. Yeah give it a shot. If it is a little overwhelming you can always just close your account. It might end up being a very valuable tool with paying off your other accounts.